Bull Creek Ranch is all about the quail! With extensive brushwork for excellent habitat, modest improvements, surface water, rural water, paved frontage and negotiable minerals you can't go wrong with this one! LOCATION: Located in southwestern Fisher County about 4 miles south of the Rolling Plains Quail Research Ranch and 15 miles northwest of Sweetwater. There is paved frontage on FM 1606 to the South and County Road 445 frontage to the west. IMPROVEMENTS: Improvements are modest. These include a 30x30 three-sided metal building for equipment storage which is located next to a small covered pavilion with a bathroom and a 1500 gallon water storage tank. Electric is provided to both the barn and the pavilion. Fencing on the East, North and majority of the South border of the ranch are in very good condition. The remainder of the fencing is fair to poor. WATER: Well and rural water are present on the ranch. 4 stock ponds and 4 wildlife water stations which are supplied by well through waterlines are scattered throughout the ranch to provide water for the wildlife. TERRAIN/HABITAT: The terrain is typical rolling plains. Excellent species of grass along with moderate mesquite cover mixed in with other brush and cacti combine to provide very good cover and the ideal quail habitat. Bull Creek traverses from west to east through the ranch and also provides great habitat for the wildlife. WILDLIFE: While the main focus of this ranch is bobwhite quail, there are also fair numbers of white-tailed deer, turkey and wild pigs. SUMMARY: This is a tremendous property for the avid quail hunter! The current owner says the hunting last year was excellent, sometimes flushing 30 coveys in a full days hunt. 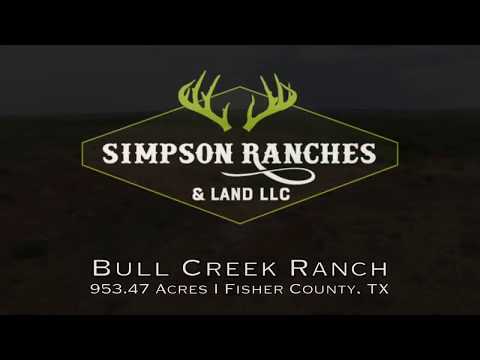 If you love quail and want to build your own ranch then this is a must see! Call Anthony for more information or to set up a showing. 210-854-6365.